When you use the Corefact Home Estimate map card in your direct mail, you have the choice of sending homeowners to www.realestatehomeprice.com or to your own unique URL. If you opt to use your own URL, i.e. your home page or a landing page, you will need to to use a widget. The widget is a way for people to enter the key code directly from your designated URL/website. 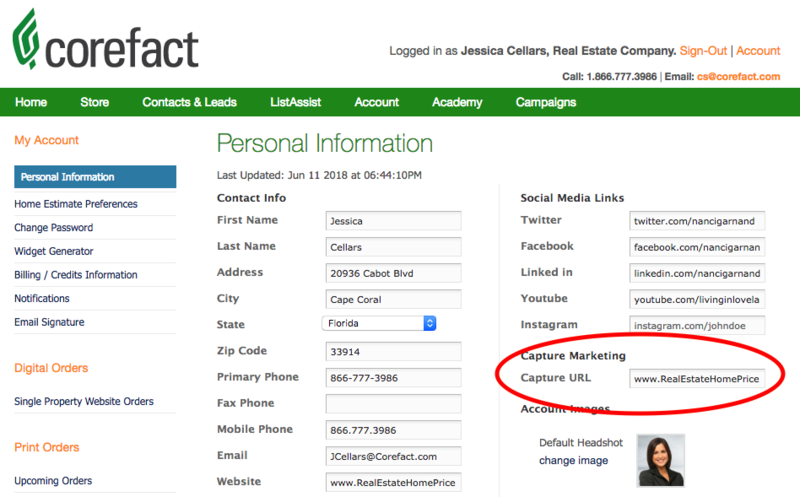 Once the widget is set up and programmed into your website, you’ll need to add the unique URL into your profile, under Account>Personal Information. Simply input the URL in the field and click save. If you put an incorrect URL in the field or you have not set up your widget correctly, we will generate an error message email when you place an order (using the Home Estimate map card), prompting you to fix the error. If you receive an error message regarding your capture URL and would like to speak to a customer service representative, please email cs@corefact.com or call 866.777.3986. Each homeowner has a personalized home estimate landing page. Here’s how you can see what the page looks like to your clients.